Monday Musings: Practice what you preach AND a recipe! 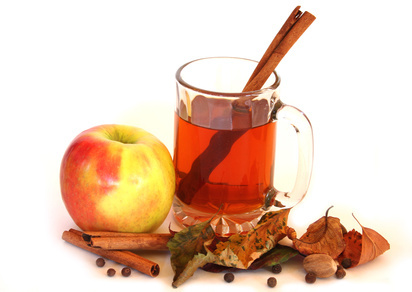 My hot cider was a hit this past weekend! This past weekend we had company over for dinner, drinks and dessert. We hadn’t seen them in some time, and we were really looking forward to it. As I was getting my menu together and getting my house together, I started pulling out the things I’d need for setting my table. I opened a new tablecloth we’d received from my mother-in-law for our anniversary, perfect for the fall season which is upon us. I started to get out my dishes and silverware, my everyday stuff, and I remembered back to a post I’d written this past spring. It got me thinking, and I put away my everyday items, some of which didn’t match each other, replacing them with my “good” dishes and silverware. So, in practicing what I preach, we used the good stuff on Saturday night, and I was glad we did. It’s nice to take it out and put it to use, and make the meal with friends that much more special, at least to me. I didn’t make a point of telling anyone or making mention of it. I just enjoyed knowing it myself. I also thought I’d share a quick recipe with you today, since I was absent on Friday. It was just too busy a week for me last week and although I had fun on Friday, I couldn’t muster up a Fun Friday post. It’s from my Better Homes and Gardens “New Cookbook,” which is quite old, and one of my favorites. I do, however, modify their recipe, so I’m putting it here as I make it, not as they say to do it. You just need a crock pot and the ingredients listed below. The cider photo above is not one of my own, I cannot take credit for it. We were having so much fun, I didn’t think to take a photo. Here is the recipe, perfect for fall. I throw it all in my crock pot and turn it on low for at least 4-6 hrs. before serving. The original recipe calls for a saucepan and putting the whole ingredients into a cheesecloth and cooking it that way, but that’s not how I do it. That’s it! I put the ingredients in, in order and turn it on. Six hours or so later, it’s hot and I guarantee it’ll warm your soul.